Everything, Everything poses the question of whether an opportunity for love is worth risking one’s life. Madeline Whittier has recently turned eighteen when the movie opens, yet she hasn’t been outside since being an infant and diagnosed with Severe Combined Immunodeficiency Disease. Her human interactions are limited to her mother, who also serves as her doctor, and Carla, her nurse and caretaker during the hours her mother is at work. To prevent Maddy’s immune system from being compromised, the house is equipped with filters and an air-lock system combined with a decontamination regimen that her mother and Carla follow. When Ollie and his family move next door, Maddy and Ollie fall in love in spite of being hindered by her condition. Once her mother finds out about their relationship, Maddy’s mom prohibits any communication between Maddy and Ollie in an attempt to protect her from being hurt. Having spent years relying on her imagination to cope with the being confined to the indoors, Maddy hatches a plan to take control of her life. Amandla Stenberg does a wonderful job striking the right balance of naiveté and emotional maturity in her portrayal of Maddie as someone whose childhood is challenged by her disease yet manages to maintain her sense of humor and endure. Everything, Everything is a teen film that is totally enjoyable and will touch your heart. Deidra & Laney Rob a Train is a sweet movie about a high school valedictorian-to-be thrust into a head of household role when her mother is arrested after an emotional meltdown at work in a Best Buy-like store. Confronted by the risk of Child Protective Services taking custody of her sister and brother along with the pressure of paying a mortgage, car payments, and putting food on the table with money that just isn’t there, Deidra hatches a plan to rob a freight train. The introduction of an absent father who is a convicted felon and fortuitously works in a rail yard, and a railway investigator attempting to salvage his career in law enforcement, serve as plot devices to showcase Deidra’s resourcefulness as she outwits the adults. Although a bit contrived, the story conveys a light-hearted mood throughout the film. What’s refreshing about Deidra & Laney Rob a Train is it portrays an interracial family encountering all of the daily struggles and problems that any other family faces, yet the focus is on the family dynamics. At no point in the story is race mentioned or addressed, and it makes a statement without explicitly doing so. Deidra & Laney Rob a Train is a worthwhile movie that is fun and thoroughly entertaining, and I’m curious to see what Ashleigh Murray chooses next. Deux jours, une nuit is a dull movie with an interesting premise. Sandra’s co-workers vote for her to be laid off rather than lose a €1,000 bonus. As an accommodation, their boss agrees to hold another vote, granting Sandra the weekend to speak with her colleagues and persuade them to change their vote. Deux jours, une nuit fails in its screenplay and sparse dialogue for narrating the story. If each co-worker shared distinct anecdotes about their personal situation and how they struggled with their decision, it would have presented an interesting dilemma by fostering sympathy for both Sandra and company that illustrates the loss of one’s dignity that results from a layoff. Instead, Sandra’s co-workers offer the same excuse how they’d like to help but cannot afford it. Humiliated by having to plea for her job and desperate to abandon the effort, Sandra’s husband persists in pressing her to continue using similar arguments about how they cannot support their two children on his income alone. As a coping mechanism for her depression, Sandra takes Xanax in many of the scenes prior to ringing co-workers’ buzzers. This process of repetition had no payoff. Although cinematography cannot rescue a poor script, a few of the scenes could have had a stronger impact by utilizing close-ups of Sandra in key moments rather than a wide shot. Marion Cotillard is a talented actress, but unfortunately it was not put to use in Two Days, One Night. Loving is a film about Mildred and Richard Loving; a black woman and white man arrested in 1958 under Virginia’s anti-miscegenation laws for the offending act of getting married. As a condition of their bail, the Lovings had to agree to leave Virginia and refrain from returning together for a period of twenty-five years. The separation from their family becomes untenable with the birth of their children, and after their second arrest, a lawyer for the American Civil Liberties Union agrees to represent the couple as it evolves into the landmark case that comes before the Supreme Court. As screenwriter and director, Jeff Nichols made some smart choices. Visually, Nichols uses numerous pastoral wide shots to convey a quiet, pensive mood that compliments the Lovings’ personalities. By using sparse dialogue, the strength of Loving is carried through Ruth Negga’s and Joel Edgerton’s facial expressions reflecting anguish and torment caused by outside forces assiduously trying to separate them, which takes a toll. Nichols’ minimalist style is effective in making certain moments more poignant such as when the Lovings lawyer explains the process of presenting arguments before the Supreme Court, and he notes the order where the State of Virginia will have an opportunity to present their defense. In a tone of straightforward sincerity Richard poses a simple question, “What is their defense?” Loving’s message is contained within that question: a law predicated on bigotry is indefensible. The injustice experienced by the Lovings can be applied to other discriminated groups and sadly is a story that resonates all too well in present day. Strong performances by the cast serve to showcase their talent. Loving is a powerful film worthy of a nomination. Neil LaBute’s Fat Pig opens in a crowded restaurant during lunch hour with Tom searching for an available table when he strikes up a conversation with Helen. She is obese and quite flirtatious with a wonderful sense of humor. Tom is immediately drawn to her confidence and candor and is sexually attracted to her. After they date and start developing a relationship, Tom recognizes Helen’s beauty; however, fear of his social circle’s shortsightedness and how they might perceive her weight is an obstacle for Tom as he tries to avoid introducing her to them. Fat Pig is a critique of our sense of self-image and the superficiality of the weight-conscious obsession within our culture. LaBute exposes the weakness of allowing our social circle to influence our judgment when finding our soul-mate. Like many of LaBute’s works, Fat Pig cleverly portrays the flaws in human behavior, although the ending does not have any of the surprises and is less decisive than his other plays. 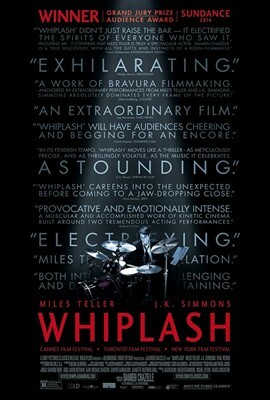 Whiplash opens with Andrew Neiman, a student practicing drums in an empty room at a prestigious New York music school. Terence Fletcher conducts a much sought after jazz band at the school, and offers Neiman a chance to join the band after observing him play. Fletcher’s instructions for arrival time turns out to be three hours before practice begins. It’s just one of a series of examples that reflect Fletcher’s domineering style of teaching where he taunts, ridicules, and humiliates his students to repeat notes until the quality of sound and rhythm is synchronized to his satisfaction. At the drop of a hat, Fletcher replaces musicians over the most minor errors intended to serve as motivation to push themselves beyond their limitations in pursuit of music. The students both respect and fear Fletcher, because his abusive tactics produce results. Even though Neiman is the main character, it’s Fletcher’s influence over him that’s central to the story. And in this regard, J.K. Simmons gives an outstanding performance that is memorable. Whiplash is an impressive film, but nevertheless it conjures up images of over-the-top parents acting out at their kids’ games and performances who would view the movie as justifying their incorrigible behavior in pursuit of rearing the next superstar. For all the characters involved in the story, the price to be paid in Whiplash seems to be worth it. Spy is a clever spoof on the Bond-genre spy movies. It features Melissa McCarthy as a CIA employee working in a non-descript office where she uses her instinct and intelligence to serve as the eyes and ears for agents on operations in the field. When the identities of her team members are revealed, McCarthy is selected for a mission to locate a mobile nuclear bomb being shopped around on the black market to the highest bidder. McCarthy’s cover is a frumpy mid-westerner on holiday in Europe, because who could possibly suspect her of being a spy. What Spy does really well is the action sequences are filmed with a seriousness that would appeal to any aficionado of these spy-genre movies even as such scenes conclude by satirizing the genre. 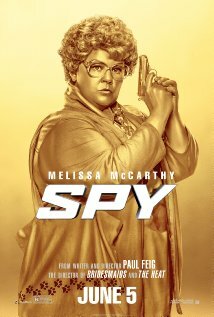 In an industry built on make believe that is hyper-sensitive to image, Melissa McCarthy would never be considered for a Bond girl, yet with a little imagination Spy moves well beyond such short-sightedness by placing McCarthy in the Bond-like role instead. Several comedic lines incorporated in the storyline are about McCarthy’s clothes or appearance, and while the dialogue fits naturally in the context of the scene, it has an added effect of responding to or commenting on the industry’s myopia. One disappointment was an early scene ends with a vomit sequence that seems to be commonplace in today’s comedies. Audiences must find them funny based on their widespread use, but somehow it seemed misplaced in Spy. The movie is thoroughly entertaining as a comedy, but the target of its underlying message through the use of wit makes Spy a highly recommended film.